Yesterday, in between a characteristically-bonkers combination of baking sunshine and torrential rain, the Society of Motor Manufacturers and Trader’s annual media test day took place at Millbrook Proving Ground. Here are some notes from the event. Slithering around the Millbrook off-road course, the Maserati Levante diesel feels much like any other SUV. It’s more than competent enough in the rough stuff to back up its chunky styling. But a subsequent road drive in the new Levante S GranLusso, powered by a 430 hp petrol V6, revealed a far more beguiling side to its character. There’s something rather exotic and unmistakably Italian about the sound of the Maserati V6. It produces a delicious howl, accompanied by a series of pops during full-throttle upshifts. The best bit, however, is the blipped downchanges. At one point I found myself driving up and down the road just to play with the beautifully sculpted aluminium paddles behind the steering wheel. And that, surely, is the point of a Maserati? It needs to be an emotive machine – the sort of thing that makes you take the long way back from work occasionally. There’s real substance here too. Body control is very impressive in Sport mode and, the odd low-speed bump aside, the Comfort setting lives up to its name as well. The cabin is beautifully designed and, again, very Italian – right down to the mocha-coloured leather of this particular example. 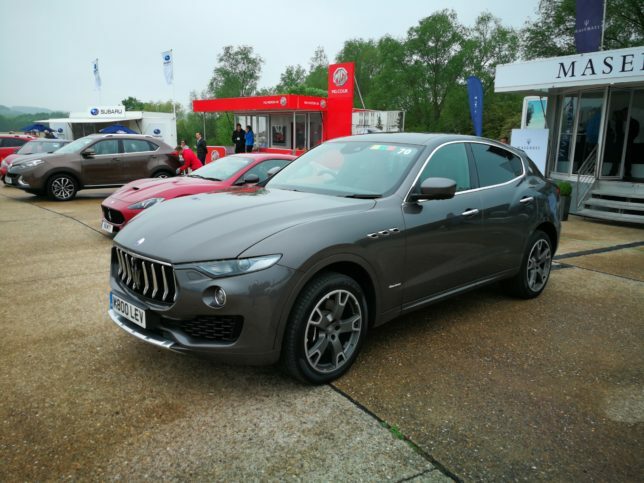 A lot of Levante buyers will no doubt be people who are drawn to the mystique of the Maserati badge yet in need of the practicality and convenience of an SUV. In its V6 petrol form, the Levante S delivers both in spades. It’s a genuinely special thing, capable of convincing even the most ardent SUV-haters that there is room for one in Maserati brand. 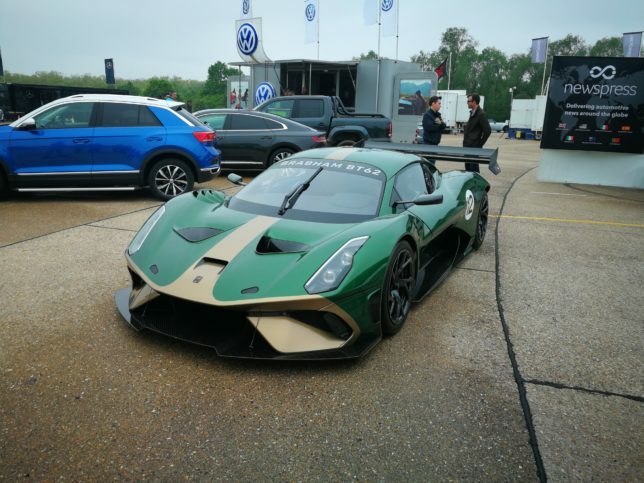 The Brabham BT62 was a surprise addition to the SMMT line up. It was very much a static exhibit, but this car is the real deal – a running prototype, currently being used for development. Seeing it in the flesh helped to dispel my cynicism about yet another hugely expensive track-only hypercar. It looks stunning, with far more intricate detailing than you can see in the photos. Would it really make you cancel the order for that McLaren Senna GTR? Chances are buyers in this market would go for both. The Up GTI is a throwback to the days when hot hatches were small, light and comparatively affordable. Its three-cylinder turbocharged engine sounds meaty and delivers surprisingly potent performance. There’s enough grip and precision to surprise some far more exotic machinery in the corners too. In the flesh, the angles and creases of the Lexus LC500’s bodywork take on an altogether more exotic aspect than they do in photographs. It is simply stunning to behold, with the concept car aesthetics continuing on the inside. Except, of course, it’s not just a show car. This being a Lexus every works perfectly, including a rather neat touchpad interface for the infotainment system. The star of the show, however, is the LC500’s 5-litre naturally aspirated V8. It’s fundamentally the same engine as the RC F, but it seems to take on an extra dimension here. Perhaps that’s just an illusion, but it feels like more of an event in the LC super-coupe. 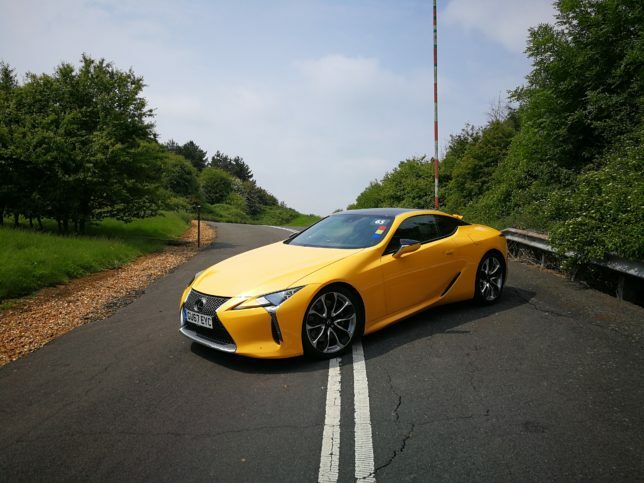 Push on and the LC500’s mass starts to come into play, but at the proverbial seven-tenths it feels special enough to challenge the likes of the Jaguar F-Type and the Porsche 911. Probably the Car of The Day for me. The Volvo XC40 has an uncanny ability to isolate you from the stresses of driving without leaving you feeling in any way detached from the experience. The First Edition has a particularly fine interior, which feels like it belongs at least one rung above its £40,000 price tag. My first experience of the Jaguar E-Pace came a couple of months ago at GKN’s winter test facility in the Swedish Arctic. There, we spent time hooning round a frozen lake sampling the grin-inducing abilities of the company’s Twinster torque vectoring system. 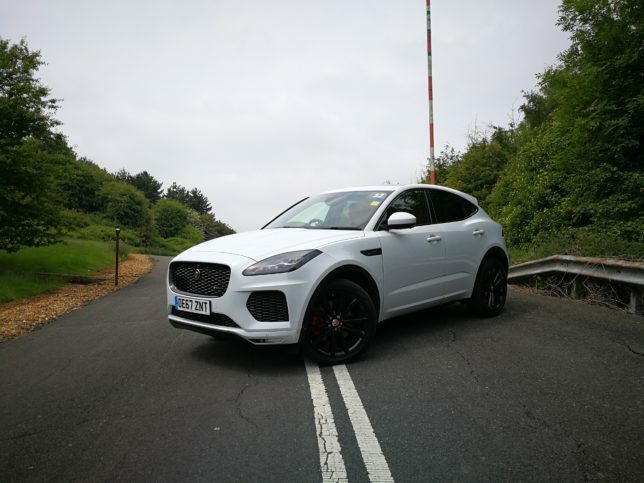 Yesterday’s drive at Millbrook was somewhat more sedate, but it highlighted a different side to the E-Pace. On tarmac there’s something very Jaguar about the car’s dynamics. That is to say, a lightness of touch combined with a beautifully supple ride that allows it to flow down the road with unexpected delicacy. I’m wracking my brains as to whether I’ve actually driven a Grand Cherokee before. This one was much as you might expect from a large, premium, American SUV. Somewhat rolly polly ride and less incisive steering than you’ll find on its European competitors, but excellent levels of comfort and refinement. The interior is good too – perhaps not to Range Rover levels, but a decent compromise given the fact this range-topping version still only costs £55,000. I was blown away by the Aston Martin DB11 V12 at this event last year. This example looks even better. And its stealthy hue matches the somewhat darker, more menacing feel of the new turbocharged V8. Drawing upon a vast well of torque, it flings you down the road with a savagery that feels every inch a match for its twelve-cylinder sibling. In Sport or Sport+ there’s a rather staccato note from the V8 that’s intoxicating when you’re in the mood, yet perhaps a little full-on for a 2+2 grand tourer. Switch the powertrain into the more relaxed GT mode and it will waft along far more discreetly. 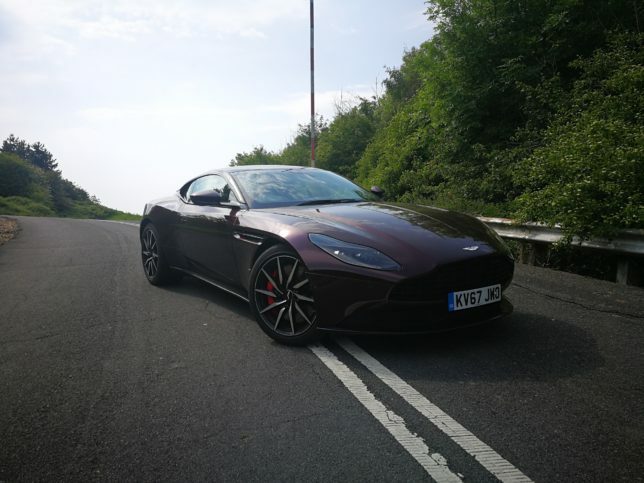 It’s difficult to say from two brief drives 12 months apart, but there’s an immediacy to the DB11 V8’s responses that make me inclined to agree with those who say it’s the better sports car of the two. Yet there’s something about the rich, creamy tone of the V12 that still seems a better fit for a traditional GT. I only managed the briefest of drives in the Hyundai i30N, punctuated by heavy traffic on the Hill Route. What I can report is that it feels properly quick, with meaty steering and iron-fisted body control. There is a touch of old school torquesteer through the electronically-controlled limited slip differential, and the 2-litre turbo engine sounds a touch synthetic at times, but it certainly feels like it’s in the right ballpark to challenge hot hatch elite. I was intrigued to finally try the Alfa Romeo Giulia Veloce. Is it, as some would suggest, a mini Quadrifoglio? Initial impressions were somewhat mixed. This warm Giulia looks stunning inside and out, but the 2-litre turbocharged inline four has a slightly diesely noise at idle. Open it up, however, and it takes on a far more pleasing rasp that has a hint of the old Alfa Twinspark engines about it. It’s a refreshingly honest soundtrack in a world where inline fours often come with an unnaturally gruff stereo-enhanced warble. There’s a lot to like about the handling too. As with the base Giulia, the Veloce feels sharp, nimble and a good deal lighter than its 3-series rivalling dimensions would imply. Beyond that, it’s hard to say a great deal from a brief lap around the Hill Route, but Alfa Romeo’s long-overdue renaissance appears to be in full swing. I wasn’t quite sure what to expect from the Mercedes X-Class pickup. It shares its platform with the Nissan Navarra, but Mercedes says it has been overhauled to such an extent that only 16% of the parts are carried over unchanged. One of the notable changes is the switch to coil spring suspension, although for now it shares the same slightly agricultural 2.3-litre diesel. Mercedes has its own 3-litre powerplant on its way, which is said to be a significant step up in both power and refinement. Almost all the body panels are bespoke to the X-Class and the interior is unmistakably Mercedes in design, if a little more robust in terms of materials than those you’ll find inside the passenger cars. My driving impressions were confined to the Millbrook off-road course and a brief drive along the site roads. Off-road, it was unfazed by Millbrook’s Black Route, with features such as hill descent control and a 360-degree camera system that allows you to see over crests when the nose is pointing skywards. On-road it was refined and reasonably alert to drive, but the Mercedes treatment hasn’t miraculously transformed it into an S-Class. Nonetheless, it’s a good-looking, high-quality pickup that will no doubt sell like hot cakes. Copyright © 2019 Chris Pickering. All rights reserved.